Our Houston Breweries Spotlight Series take a deep look at all of the most iconic and upstart craft breweries across Greater Houston. Check out our Definitive Guide to Houston Breweries. 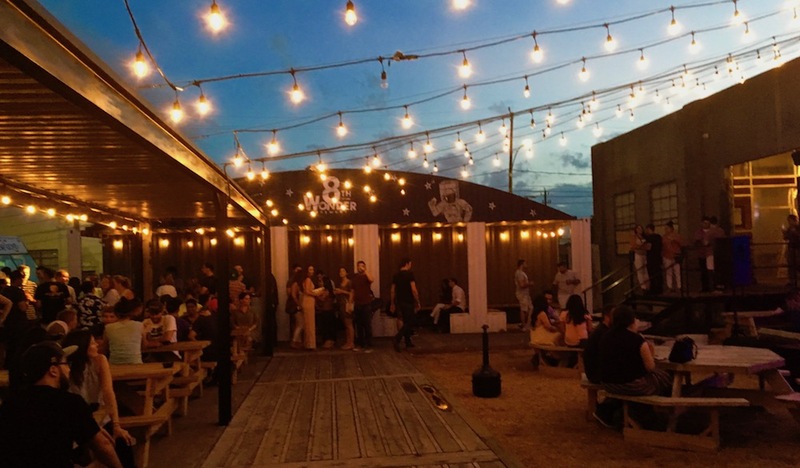 Say cheers to delicious local beers and plenty of Houston pride at 8th Wonder Brewery in the heart of East Downtown. Nestled just east of Downtown‘s towering skyscrapers in EaDo, and just a hop-and-skip away from three of the city’s glimmering stadiums, lies a brewery that has been one of the quickest growing and celebrated craft beer spots in all of Houston. That’s where you’ll find 8th Wonder Brewery, named for the world-famous and cavernous Astrodome on the south side of the city. Inside their front doors, you’ll find photographs and memorabilia of the historic Dome adorning the walls, along with customized jerseys from each of the city’s sports franchises in a clear exhibition of the brewery’s pride in the city of Houston. Because of its prime location on the east side of Downtown, 8th Wonder has become an established pre-game stop before any number of Rockets, Astros, Dynamo, and Dash games. A popular meetup spot, fans are welcome to enjoy a couple brews before heading several blocks over to a stadium where they can also find 8th Wonder beers on tap. And if the indoors is a tad crowded, there’s ample space in the back, complete with tables, benches, and plenty of room for the crowds that tend to swing through on the weekend. Notably, one of their most popular beers, a cream ale called Dome Faux’m, can be found in any of the Houston stadia and makes for an easy beer to drink during one of James Harden’s eye-popping performances or an Astros RBI rally. Rocket Fuel – Styled after the vietnamese cold coffee, this porter is a touch sweet and creamy. Hopston – The so-called TXIPA provides a hoppy taste but isn’t too overpowering to drink in the sweltering summers of Houston. Weisstheimer (Spring/Summer Seasonal) – A classic hefeweizen that plays on the name of one of Houston’s most white-knuckle roads, offers a little bit of refreshing fruitiness. Dream Shake (Winter Seasonal) – A stout, this beer is heavy on taste and alcohol – a perfect combination for Houston’s mild cold snaps. Bringing in those crowds is a healthy list of events hosted by the brewery. There’s the weekly 8th Track Live Music Series that provides a stage for local music acts, weekend crawfish boils, pet adoption drives. Looking for something that speaks to the heart of the city? Check out the brewery’s celebration of Houston’s car culture icon, the S.L.A.B., complete with performances from homegrown rapper Paul Wall. For the minds behind 8th Wonder, the love of Houston goes further back than the brewery’s opening in 2013. With a master’s degree from the nearby University of Houston, Ryan Soroka teamed up with Matt Marcus and Alex Vassilakidis to open the Eatsie Boys food truck in 2011 and, eventually, a brick-and-mortar location in Montrose. Bringing in Master Brewer Aaron Corsi, the group began 8th Wonder a couple years later and, when their lease on the Eatsie Boys restaurant expired in 2015, the four of them decided to ultimately focus on the brewery business as it began to gain a foothold in the local scene. The food truck, however, continues to feed Houston’s stomachs and can be found parked in the back of 8th Wonder every day serving burgers and fries. With an established presence in the city they love, the brewery has begun expanding regionally into Austin, Dallas, and, most recently, San Antonio. 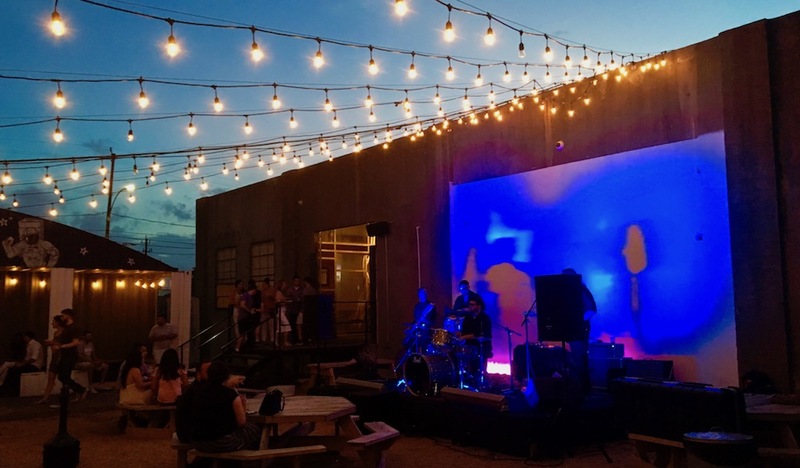 Though it can found on Dallas Street, it’s a brewery that is quintessentially Houston and has become the pre-game, post-work, weekend destination for many. If you’re looking for a sweet spot to visit, try a Friday night where it can still be lively with the post-work crowd and you’ll be able to catch a tour (only available weekdays at 7pm). Looking for more great craft brewery options in Greater Houston? Check out our Definitive Guide to Houston Breweries inside the Loop and in neighboring communities like Conroe, Kay, Pearland, Galveston, and beyond.